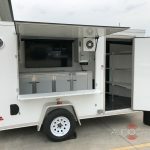 We were recently contacted by a Fargo-based company looking to have their tailgating trailer upgraded with an audio system. They planned to use the trailer at North Dakota State Bison football games and whenever their employees get together for picnics. 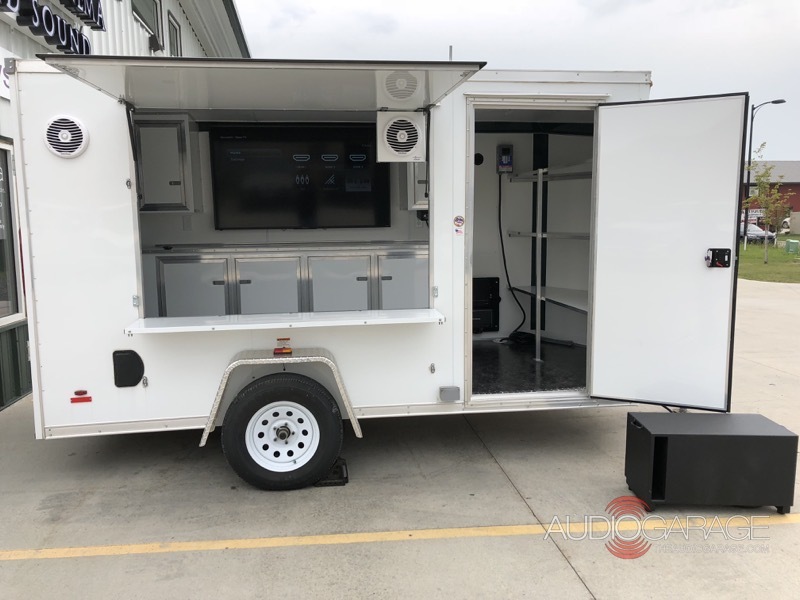 We had a look at the trailer and talked to the owners about how they planned on using it so we could put together a plan to add an A/V upgrade. We started the project by mounting a 65-inch Sharp TV on the back wall of the trailer across from the main seating position. The television is fed by a Direct TV satellite receiver so they can watch anything they want. We included a provision to connect a small Honda generator to power the TV and satellite receiver. Alternatively, the trailer can be plugged into a standard wall outlet with an extension cord. Our fabrication team made a panel to mount the electronics on. When the window is closed one of the speakers mounted to it also folds in. In full party-mode, this trailer rocks! 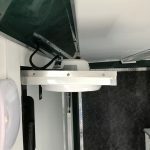 We started the sound system installation by mounting a Kenwood KDC-X702 AM/FM receiver in a small enclosure under one of the storage cabinets in the trailer. The Kenwood receiver lets the operator play CDs, audio from the Direct TV system or music from a smartphone or USB memory stick. The output of the radio feeds to a Rockford Fosgate Prime Series R600X5 five-channel amplifier. 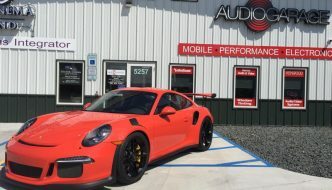 We configured the amp as a three-channel to power a set of Rockford Fosgate PM282X coaxial marine speakers and a P2D412 12-inch Rockford Fosgate subwoofer. The eight-inch marine-grade speakers are mounted on the front of the trailer. One speaker is mounted in the wall just left of the “serving window” and the second is on a bracket attached to the window cover. When the trailer is open, the speaker faces outward to let everyone hear whatever is playing. Our fabrication team created a custom subwoofer enclosure for the Punch Series subwoofer. 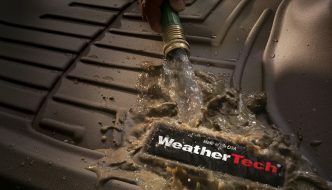 Rather than mount the sub in the trailer and cause it to rattle uncontrollably, the Line-X coated enclosure can be placed outside and connected using a trailer lighting connector. 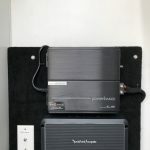 We added an Interstate YellowTop battery to power the audio system when the trailer isn’t connected to a 120V outlet or running on the generator. A Powerbass APS-100X power supply feeds the system and charges the battery when the trailer is plugged in. 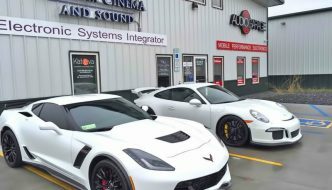 With the entertainment system installation complete, the owners returned to Audio Garage to see what we had created. They loved the way it sounds and were excited to get the graphic wrap installed on the trailer so they could start using it at Bison games. 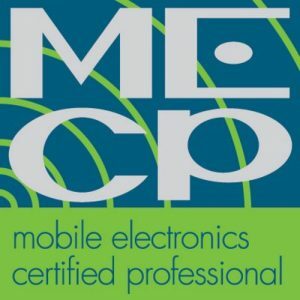 If you are in the Fargo area and are looking for a custom audio system, drop by our store or send us an e-mail using our contact page to schedule a personal consultation with one of our product experts.